So Astra Bridal helped you find the wedding gown of your dreams... we kitted you out in beautiful shoes to match and all the accessories too! You look exactly how you dreamed! But uh oh... how on earth are you gonna 'go' when nature calls on your wedding day?! FEAR NOT! We at Astra Bridal want to ensure that you are FULLY EQUIPPED with the know how of everything to do with your gown on the day and we've found some nifty diagrams to help! 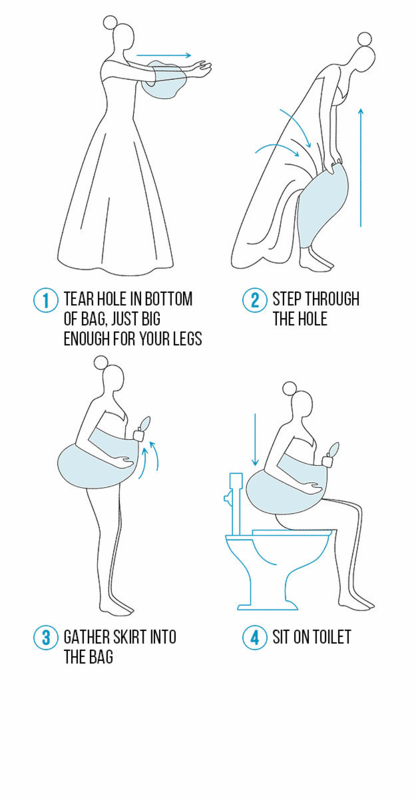 There are 4 different ways to pee in your wedding gown... and some techniques are best suited to the type of gown you are wearing, which we will detail below. If you are have another possible way feel free to let us know in the comments below! This works fine for a fit and flare/mermaid gown, however the bigger the skirt, the larger your trash sack is gonna have to be... an A-line gown can just fit into a 150L bag, so you would be best to go straight for the 240L trash sack if you have a ball gown. This handy little prop has been getting a lot of attention over the past few years, and for good reason too! You can put this on under your gown and wear it all day long! It acts as another petticoat layer but with a good purpose. This also means that you can go to the bathroom as many times as you want! It also has nifty little arm holes so, unlike the trash sack, you can really envelop youself into the bridal buddy and you can do this all by yourself too! The bridal buddy is said to work for all gowns, big and small. It comes in two different sizes; petite 32" and average/tall 42", but there have been mixed reviews about whether the ball gown style fits completely inside the bridal buddy. So there you have it! As we said, we've got you covered, literally... well mostly... HA!